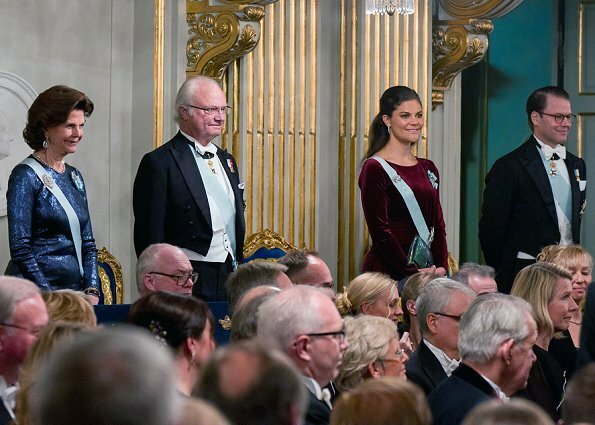 On December 20, Wednesday, King Carl Gustaf, Queen Silvia, Crown Princess Victoria, Prince Daniel, Prince Carl Philip, Princess Sofia, Princess Madeleine and Christopher O'Neill attended 2017 academic year's closing meeting of Swedish Academy, held at the Old Stock Exchange building in Stockholm. 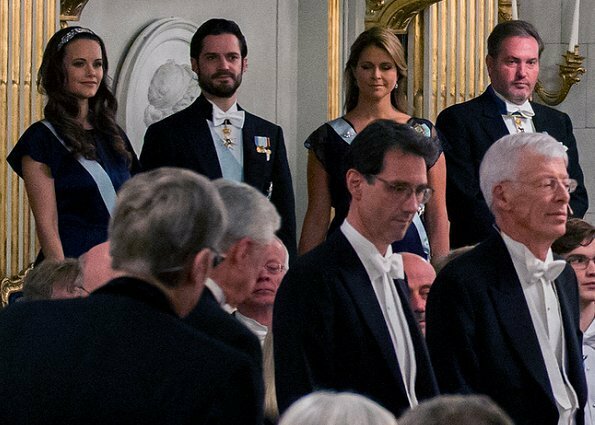 Swedish Academy concludes its working year by a formal gathering at the Stock Exchange Building every year on December 20. Ach, um Himmels Willen, hat Sofia keine Stylistin mehr ??? Dieser Mantel sieht aus wie ein Morgenrock aus dem letzten Jahrhundert. 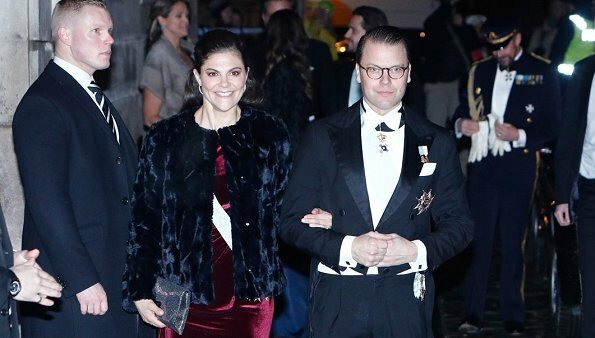 Madeleine ist wunderschön wie immer und die Kleider der Königin und der Kronprinzessin hätte ich gerne näher bewundert, aber leider sind sie kaum zu sehen. Because of the way the person is situated behind Victoria in the second picture, I almost was ecstatic that Victoria had worn her hair down. Sadly, no. She does! I have seen other pictures on other blogs. You can definitely admire her thick long hair and I hope she ventures more from her norm in 2018. M Hall, I hope that too! Wonderful colour for Victoria. They all look good! I don't see it that way in the second picture - Madeleine is radiant, Christopher could lose a few pounds. 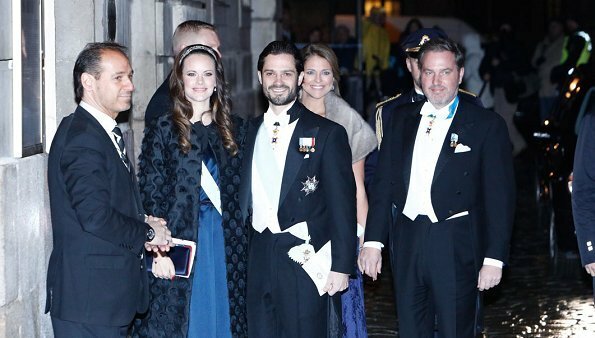 Sofia's coat doesn't go well at all with her gown, and it and Carl Philip's pants are too long. Though her jacket arriving had a blue effect. Best picture of Victoria I've seen in a while, beautiful hair and the color of the dress looks good on her. Madeleine looks OK but I don't like her wrap. Sofia, usually my favorite, doesn't look too good with that strange coat and too long dress, and I don't like her hair like that, it makes her forehead look very big. 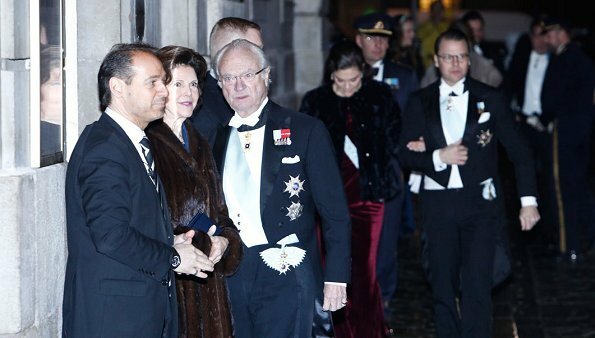 December seems to be the month of many big events in the Swedish royal house, where there is an opportunity to wear long gala dresses, but I wonder why Sofia is wearing tiara and the others do not ? Victoria looks absolutely stunning in this purple red velvet dress! Sorry, but to me Madeleines gown looks like a nightgown and cheep. That black lace is just too much. Victoria looks very good, she really has nice hair. 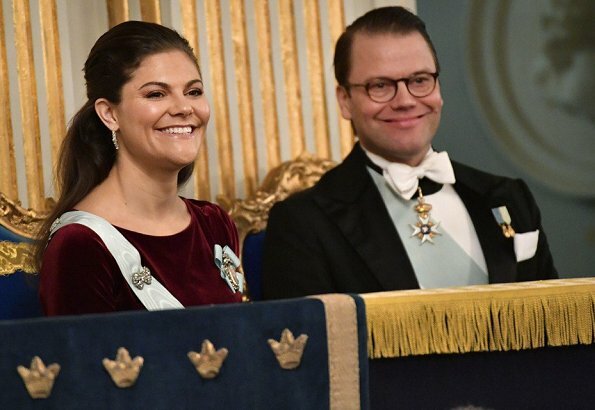 Sofias hair should be shorter, but she doesn't have a tiara - it's a headband. Of course she knows the dress code. How can you think that she alone can decide how she get dressed. Blue is a very good colour for her. Lovely to see them all decked out and out together once again. I love the rich, deep colours of winter... P. Victoria’s maroon, and black (coat). Ladies all look elegant ( as do the men too) in the midst of mothering, raising young families, being pregnant, and the short days in the winter north! 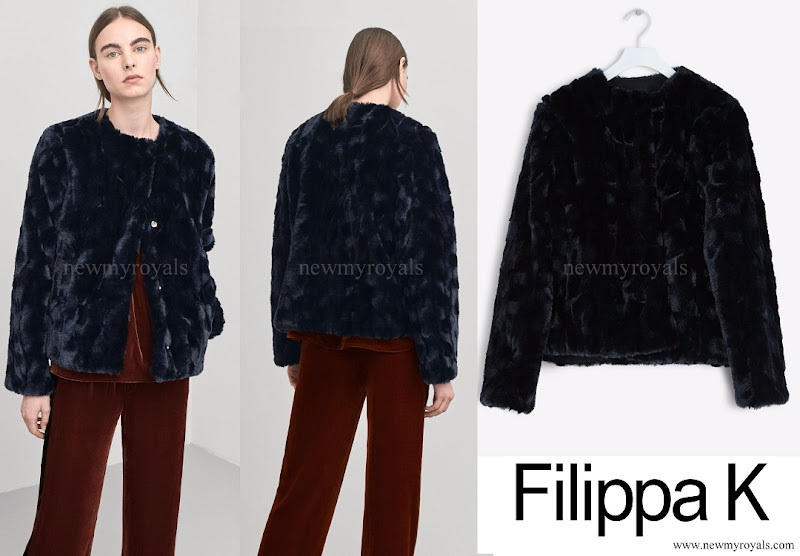 Victoria looks lovely in a fabric and colour that is perfect for winter - and her hairstyle is such a pleasant surprise! I also like her cute jacket. 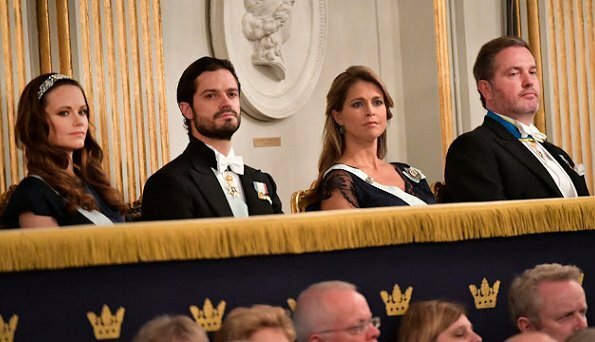 I'm not impressed by either Madeleine's or Sofia's dresses. Ordinary. And Sofia's hair just looks silly like that - more suitable to a 10 year old. 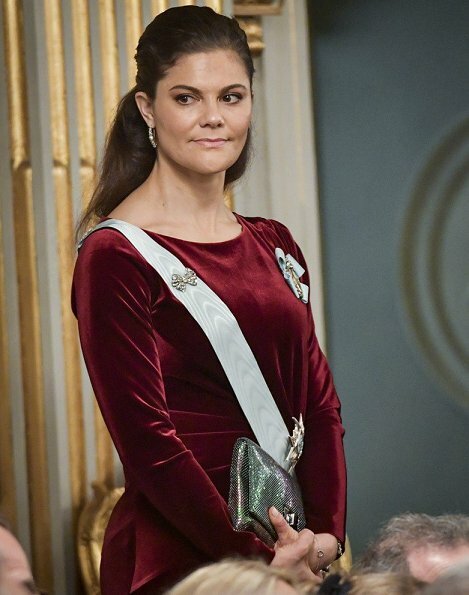 Beautiful Princess Madeleine. She is just stunning.